Ithaca, NY USA - Matereality’s Version 9 release continues the company’s mission of providing software to streamline materials-related tasks of engineers with different roles in an enterprise. 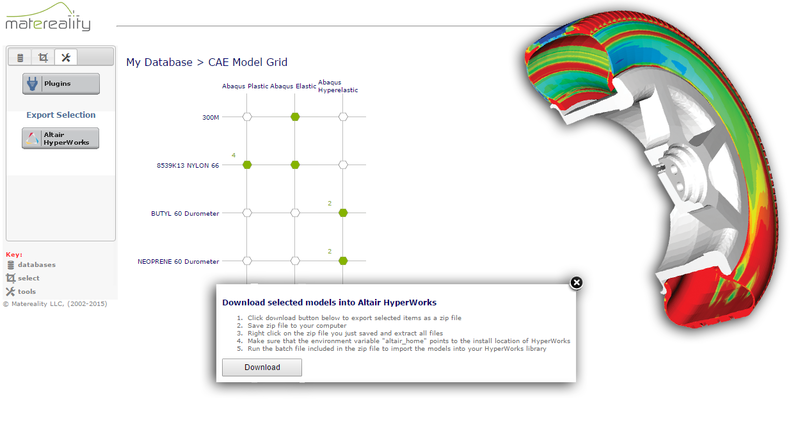 The new release provides a master material file management infrastructure with integration to Altair HyperWorks, ANSYS Workbench, Abaqus/CAE, and PTC Creo. Authoring and collaboration interfaces: A new authoring interface added to the Data Grids enables users to act upon and fill the holes in their databases as they see them. Users can now launch the Dataloader Module to add property data from a gap in their Property Grid view. A Materials Engineer can add information about the material, such as processing, composition, certifications and MSDS, directly from the Material Grid view. The CAE Engineer can upload a material file or create new material files using Matereality’s CAE Modeler directly from the CAE Model grid. 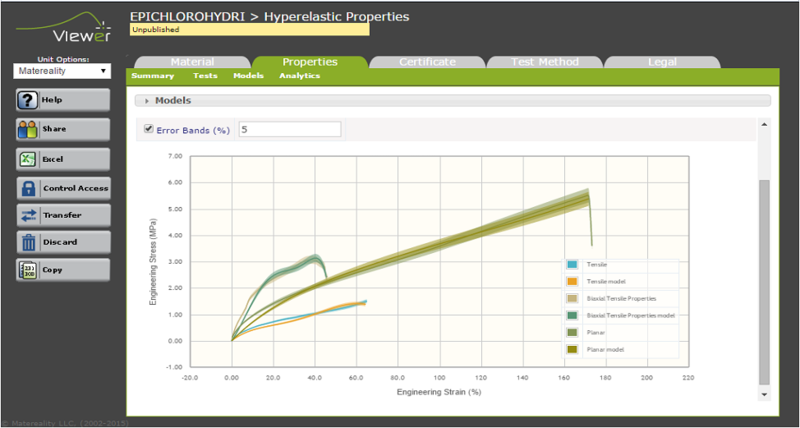 At the enterprise software level, the materials specification management software module has been expanded so that materials engineers can efficiently create and manage the material specifications of the company. The collaborative framework has been expanded beyond the sharing of property data. Where the requisite data is not available, users can now utilize Matereality to request content for database-building from their test labs, peers and material suppliers. Properties, materials information, CAE material files, test methods and test reports of the enterprise can now be consolidated in a single place with adequate controls. The software enforces the need for governance common in most enterprises, where authorship is restricted to domain experts, with gatekeepers for inspection and certification prior to data publication. Master material file creation and export: CAE engineers can upload and catalog simulation material files using the authoring feature of the CAE Model Grid app. The CAE Model Grid app also displays all material files created using Matereality’s CAE Modeler software. Material files collected in a CAE Model Grid can be exported singly, or collectively for inclusion in master material files for common CAE pre-processors. This new ability allows for better integration with existing product design workflows (see example in Figure 1). Data processing, analytics and statistical tools: New, improved data-fitting capabilities allow for creation of models of reasonable complexity, such as hyperelastic equations and non-Newtonian viscosity models. Users can now upload their own equations for data fitting and visualization. The Analyzer software module has new capabilities to compute statistical variance on numeric data as well as sophisticated error-banding for curve data. This allows users to make objective decisions on data quality and repeatability. The Analyzer can also be used to compare materials and perform actions such as analyzing historic behavioral trends in a particular material. Where the enterprises are not ready to for in-house deployment, Matereality offers a partial solution via a cloud service so individual engineers and engineering workgroups can achieve immediate benefits. Matereality’s usage plans can smoothly scale as more of the enterprise comes online, until complete adoption is achieved. During the ongoing Version 9 upgrade for the Matereality Cloud, users with an active usage plan can evaluate Version 9 via a beta testing program. To participate, send a request to info@matereality.com. Matereality® Software for Materials gives manufacturing enterprises the means to build a centralized, secure materials knowledge core to store properties, CAE material files, and material information on any material. The built-in suite of web-based software helps engineers visualize and understand material data, create CAE models and manage materials information. The company also operates private and public material databases on the cloud. Matereality's ready-for-deployment, patented technology provides material databases and solutions for different needs, budgets and company sizes: a Personal Database for the single user, a Workgroup Database for small groups, and Material Data Servers for the enterprise. Matereality is an affiliate of DatapointLabs Technical Center for Materials, which provides accurate material testing, material parameter conversion and model validation services for CAE, allowing companies to populate their databases with high-quality, application-ready data for design and new product development. Together, the companies provide a comprehensive resource to strengthen the materials knowledge core of manufacturing enterprises.